In the southwestern Pakistani city of Quetta, a deadly explosion has led to the death of at least 20 and rendered over 40 injured. It is believed that the blast was to target members of the Hazara community in Quetta’s Hazarganji market. The explosion took place as Hazaras, who are Shia Muslims, were buying vegetables early in the morning. The attack claimed the lives of nine Hazara and one Frontier Corps (FC) soldier who was deputed for the community’s security, said Deputy Inspector General (DIG), Abdul Razzaq Cheema. The 10 others who lost their lives included shopkeepers, businessmen, and citizens working or residing in the area. Cheema said police would not know whether the bomb was planted in the potato sacks or a suicide attack until investigating teams, who had cordoned off the site, completed their analysis. The police had no intelligence about this target, at a press conference later DIG said there had been no warning the market might be attacked. 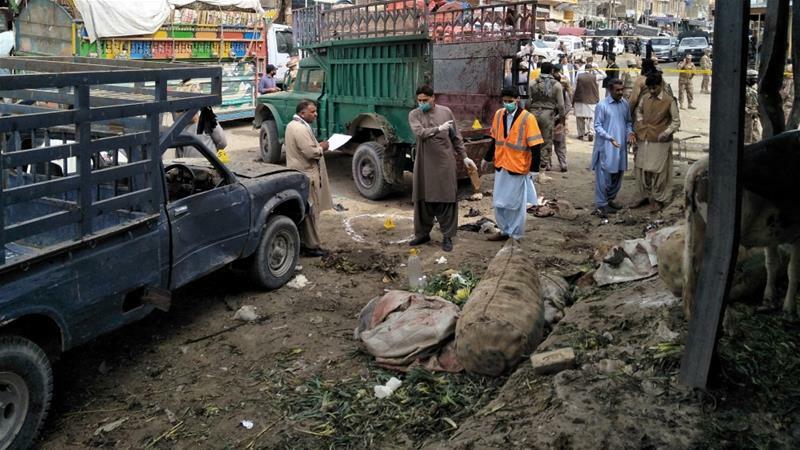 Responding to the horrific bombing of an open-air marketplace in a neighborhood where many members of Shi’a Hazara community live in Quetta that killed at least 20 people and wounded several others on the morning of 12 April 2019, Amnesty International’s Deputy South Asia Director, Omar Waraich, said: This horrific loss of life is a painful reminder of the threats that Quetta’s Hazara community continues to face. The Hazara community, predominantly Shia Muslims, in Quetta, in Pakistan, has been the target of persecution and violence. This attack comes at a time when Prime Minister Imran Khan’s government has made important commitments to protect all religious groups in the country. Those commitments must translate now into policies to effectively protect the Hazaras of Quetta, ending more than a decade of bloodshed that has scarred their community. “We demand more security from the government and all those involved in today’s act of terrorism should be found and punished.” Qadir Nayil, a Hazara community leader, asked the government for provision of better protection. Can the Pakistan Prime Minister Imran Khan and his security agencies promise protection against terrorism in Quetta? Since 2013, more than 509 Shia Muslims – mainly ethnic Hazaras – have been killed in a campaign of targeted shootings and bombings in Balochistan province, according to government data. The majority of attacks have occurred in the provincial capital, Quetta, where most of the country’s roughly 600,000 Hazaras reside. Pakistani Hazaras face a constant threat of targeted violence. Many say the security response has been ghettoizing and ineffective. Pakistan security agencies are faced with an uphill and ever escalating challenge of ethnic and sectarian violence in their own country. Protection of the Hazara community is possible if only the power equation between the forces of violence and security agencies is leveled to a point where the perpetrators are forced out and the justice is served. A company (Brainwave Science) that started off with a strong conviction in the ideals of truth and justice for all under the rule of law has already developed a technology ready to help facilitate circumstances that change the power dynamics in favor of counter-terrorism authorities. iCognative is an important breakthrough in identifying active and inactive terrorists. iCognative technology is based on a virtually infallible science: when the brain recognizes certain information – words, phrases or pictures displayed for a nano-second on a computer screen — it triggers an involuntary and specific electrical brainwave signal, which can be measured and analyzed. The non-obtrusive iCognative test is completely tool-dependent, easy to set up in any environment, and available in all languages. As a result, it is poised to be a real game-changer in the fight against terrorism. In this case, iCognative technology by Brainwave Science is of special relevance because has it been proven to be over 99% accurate in detecting EOD/IED bomb knowledge, high intelligence value individuals, and links between a suspect and known terrorists, places and events. As reported by law enforcement agencies, an Improvised Explosive Device (IED) was planted in a gunny sack filled with potatoes. It is a great investigation detail that can be used to specifically screen all the suspects apprehended by law enforcement, in this case, using iCognative technology to quickly determine who possess this specialized knowledge of IED/EOD knowledge. iCognative is a revolutionary new scientific technology to detect specific information stored in the brain. It provides evidence to identify criminals and terrorists accurately and scientifically. It measures brainwave responses to terrorism-relevant or crime-relevant words or pictures presented on a computer screen, or information characteristic of people with specific training or expertise such as trained terrorists or bomb makers. When the suspects, in this case, are subjected to a virtually infallible and exceptionally accurate iCognative test using stimuli from investigation facts their brains will do all the talking. Details that can be used as stimuli may include names, dates and time of the attack, type of IED device used, timed or remote-controlled IED, pictures of the location of the potato store where the explosion occurred and suicide attacker’s picture or name all these details can help investigations expert utilize iCognative test and lead the investigation in the right direction to some conclusive evidence and thereby help delivery of truth and justice in this case. The very knowledge of the fact the Quetta Police has deployed iCognative technology to solve terrorism-related cases and other 85% of all criminal cases wherever investigation has been carried out may very well serve as a very powerful deterrent for those planning attacks on Hazara community in Quetta region. An extraordinary wealth of intelligence collected through iCognative can markedly transform how cases and leads are pursued. Counterterrorism investigators are trained to find, analyze, and record the specific details of terrorist crimes, particularly those details that are unique to each specific crime. These are the items that can most effectively be used in iCognative test to detect evidence of a suspect’s participation stored in his brain. This unique security solution is best positioned to corroborate evidence that will either go concealed by a terrorist, using advanced neurological responses that cannot be manipulated or suppressed. The use of iCognative will provide accurate and reliable information that will aid law enforcement in their fight against terrorism, setting the fundamental for a new strategy and approach that can bring real results.